Thanksgiving dinner is arguably the best meal of the year, but finding foods to keep your youngest guests happy is challenging. If you prepare an arsenal of foods kids love, even the pickiest eaters will scramble for seconds. Mix and match the following foods to suit your budget and schedule. Thanksgiving dinner isn't known for being low in fat and calories, but you can make it healthier by using low-fat ingredients in recipes. Vegetable tray and dip: Kids love crunchy veggies when dipped in hummus or low-fat ranch dressing. You can purchase pre-made veggie trays or make your own with carrots, celery, cucumbers, sweet pepper, broccoli florets, and grape tomatoes. Cheese and crackers: Cheese is a fun and delicious finger food kids eat up. A selection of sliced cheeses such as cheddar, Swiss, and Monterey Jack served with crackers is a great kids' appetizer. Snack mix: There's a good reason snack mixes get prime real estate in grocery stores -- kids love them! Try making a ranch cereal mix with Chex cereal, mixed nuts, pretzels, and spices. Keep portions in check by serving in individual bags. Mini corn-dog muffins: Kids love corn dogs, so a mini corn muffin stuffed with a piece of hot dog is tasty, visually appealing, and makes an ideal meal starter. Use a box mix, follow the directions, and pour in individual cupcake wrappers. Cut a small piece of hot dog to put in the middle and bake as directed on the box. Stuffed celery: Kids may not like eating celery on its own, but when it's stuffed with cream cheese, they'll gobble it up. Add a few raisins to make this appetizer more fun to eat. Bread: Even the pickiest eaters usually eat bread. Place a well-stocked bread basket and plain, herb, or honey butter on the kids' table. 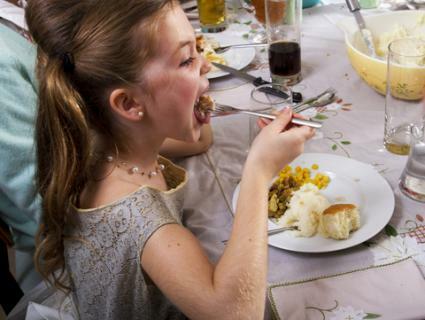 Turkey: Most kids like roast turkey, Thanksgiving's go-to dish, especially slathered in gravy. Ham: Kids who don't like turkey may enjoy ham. Bake your ham with a sweet ham glaze to make it even more kid-friendly. Turkey nuggets: Kids love finger foods, especially breaded nuggets. Make turkey nuggets that have a crispy cornflake crust and are baked. Cornish hens: Bring the large holiday bird down to kid-size by making Cornish hens for the kids. They look like small turkeys and kids will enjoy having their own personal main dish. Stuffing: Thanksgiving stuffing is a kid-favorite. Add kid-appeal to your stuffing by forming it into patties and baking instead of baking in a casserole. Add sweetness with chopped cranberries, raisins, or dates. Mashed potatoes: Almost all kids love mashed potatoes, but you can make them more tempting by adding shredded cheddar cheese and sour cream; keep the chives on the side. Sweet potato casserole: Most kids have a sweet tooth and will eat up sweet potatoes baked with brown sugar, vanilla and spices, topped with gooey marshmallows. Macaroni and cheese: Macaroni and cheese isn't a Thanksgiving staple, but it's a kid favorite any time of the year. It makes a nice side dish for kids at any special occasion. Green bean casserole: On their own, green beans may not appeal to kids. But the crispy fried onions topping this green bean casserole make it a favorite. Corn pudding: If you tell kids they're eating "pudding," you'll get their attention. This recipe is made with fresh corn, cream, butter, and seasonings. Cranberry sauce: Sweet, cranberry sauce tickles kids' taste buds and is delicious on its own, or spread on turkey. It also makes a great dipping sauce for turkey nuggets. Broccoli cheese casserole: If it's combined with cheese, kids flip over it -- even broccoli. Leave out the mushrooms and add an extra sprinkle of cheese to make it especially kid-friendly. Pies: Most kids love pie, especially if it's topped with whipped cream, Cool Whip, or ice cream. To make sure there's a pie for everyone's tastes, offer a variety of Thanksgiving classics such as apple or pumpkin, and consider making a chocolate cream pie, too. Most kids love chocolate. Cookies: A cookie is the perfect ending for kids full from dinner or who have smaller appetites. Make a cookie tray of favorites such as snickerdoodles, sugar cookies, and ginger snaps. Pumpkin roll: A pumpkin roll featuring a sweet cream cheese filling rolled up in spicy pumpkin sponge cake is delicious and fun for kids to eat. Pumpkin crispy rice treats: Rice Krispies treats are a marshmallow, finger-food concoction beloved by kids. This harvest version adds pumpkin and pumpkin pie spice to the traditional recipe. Caramel apples: Fresh apples covered in buttery caramel will have kids of all ages running to your dessert table. Eating food on a stick makes dessert fun for kids. Apple cider: Cold or warmed, apple cider is reminiscent of apple juice, another drink popular with kids. Cranberry-citrus punch: Kids like to feel as important as adults on special occasions. You can do this by giving them their own punch made from frozen cranberry juice concentrate, lemon-lime soda, and fresh orange juice. Simply mix the ingredients in a large pitcher until you achieve the right balance for your taste buds. Hot chocolate: Warm and sweet, hot chocolate conjures comforting memories for kids. Add more kid-appeal by topping hot chocolate with a dash of cinnamon, chocolate shavings, mini chocolate chips, or whipped cream. 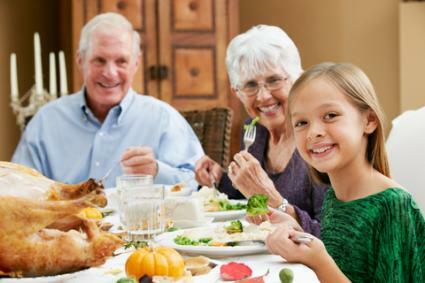 Thanksgiving is about spending time with family and friends, but the day centers around food. Kids often feel left out of the big meal if they're relegated to the "kids' table," and feel worse if they don't like the foods served. Including foods kids love to eat on Thanksgiving in your menu will help keep children satisfied and make the holiday memorable.